On this ultimate sushi-lover’s tour, you'll visit the world's largest fish market — Tsukiji Fish Market — and try your hand at making sushi, which you’ll then enjoy for lunch. 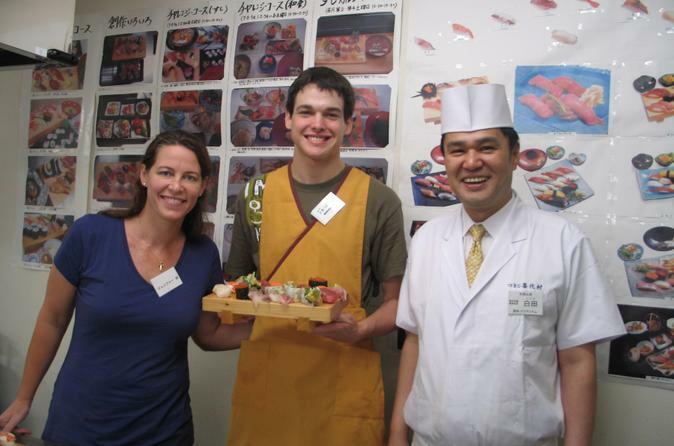 Learn from a sushi master how to make both rolls and nigiri, and meet Tokyo locals who are also in the class. Subway transport to the market with a guide is included. Your sushi-themed morning tour starts at the Hamamatsucho Bus Terminal in Tokyo, where you’ll meet your guide and head by subway to the Tsukiji Fish Market, the world's largest fish and seafood market and one of the largest wholesale markets of any kind. The market is split into the inner market, the wholesale portion that is restricted to visitors, and the outer market, the retail portion that features food stands, restaurants and shops selling Japanese kitchen tools. With your guide, stay in the outer market for about 45 minutes to explore the many stalls packed with exotic seafood and learn about the types of fish you’ll work with at your cooking class. Next, your tour continues at a popular sushi restaurant for your sushi-making class. This cooking school is popular with both locals and visitors, and your guide will translate your teacher’s instructions. Learn the art of making sushi — both rolls and nigiri — before sitting down to enjoy your creations for lunch. Your tour concludes at the entrance to Tsukiji Station, where your guide can direct you to your preferred location.